Excel Entertainment’s Independence release Gold collected a whopping 71.30 crores over the first weekend. Gold‘s first-week collection Wednesday: 25.25 crores, Thursday: 8.10 crores, Friday: 10.19 crores, Saturday: 12.30 crores, Sun: 15.55 crores. The movie enjoyed an extended weekend of 5 days. It has crossed the 1st weekend collections of many major movies. The bottom 3 in the list are Raid (41.01 crores), PadMan (40.05 crores) & Veere Di Wedding (36.52 crores). Gold has crossed Raid and Satyameva Jayate which had collected 41.01 crores and 56.91 crores respectively. Gold Scores 5th Highest Weekend 1 (Bollywood) Of 2018; Sataymeva Jayate Is At 6th! It is now 5th highest 1st weekend earner of 2018 at the box office, but if we include Avengers: Infinity War (94.30 crores) then it’ll stand at the 6th position. The top 4 are Sanju (120.06 crores), Padmaavat (114 crores – 4 day weekend), Race 3 (106.47 crores) and Avengers: Infinity War (94.30 crores). John Abraham’s Satyameva Jayate has also been minting decent amount at the box office. It collected 56.91 crores in its 5-day extended weekend one. The movie has crossed the 1st weekend collections of Raid, PadMan & Veere Di Wedding. 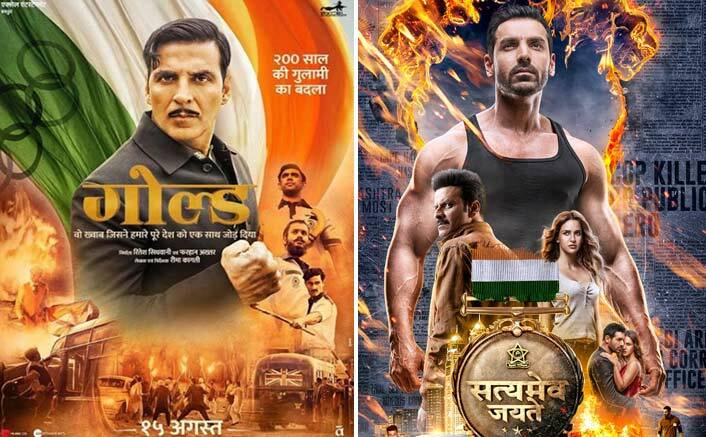 Gold VS Satyameva Jayate Box Office: Day Wise Track Of Their Successful Journey! Gold, Reema Kagti’s directorial venture has not only got a thumbs up from critics but has struck the right chord with fans too. From B-Town celebrities to the fans of the actors, Gold received immense love from the audience. From the performance to the chartbusters, Gold happens to be one of the most loved movies of this season. In spite of stiff competition from John Abraham’s Satyamev Jayate at the box office, Gold is dominating the Box Office comfortably. So much so, that the film is now slowly inching towards the Rs 100-crore mark. Satyameva Jayate is written and directed by Milap Milan Zaveri and produced by Bhushan Kumar, Krishan Kumar, Nikkhil Advani (Emmay Entertainment), Monisha Advani & Madhu Bhojwani. The movie features John Abraham, Manoj Bajpayee, Amruta Khanvilkar and Aisha Sharma in lead roles. The post Gold Scores 5th Highest Weekend 1 (Bollywood) Of 2018; Satyameva Jayate Is At 6th! appeared first on Koimoi. What Box Office Collections On Thursday Would Ensure A Good Trend For Gold & Satyameva Jayate? Gold Set To Be The 9th Akshay Kumar Film To Enter The 100 Crore Club – 2nd Highest Of All Time!